Ronnie O'Sullivan is "the boy who cried wolf" over repeated claims he was set to retire, says Shaun Murphy. O'Sullivan, 39, last reversed a decision to quit the sport just before he won his fifth world title in 2013. When asked about O'Sullivan, Murphy, following his 10-3 first round win over Robin Hull at this year's tournament, said: "Everyone takes the things he says with a pinch of salt. "Nobody believes him anymore when he says he's going to give up snooker." The 2005 world champion added: "We've all seen it for so many years. We prefer it when he just gets on with it because we're all thankful that somebody like him is in our sport. 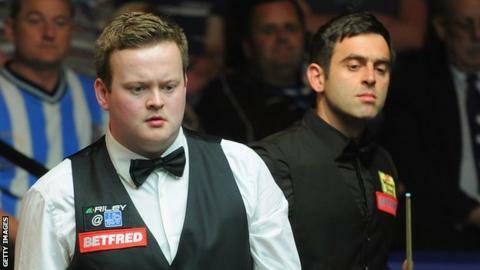 His abilities as a snooker player have never been in doubt." Murphy will next play Joe Perry, who beat China's Zhang Anda 10-4 in the first round. O'Sullivan reached the second round at the expense of qualifier Craig Steadman, briefly playing in his socks on his way to a 10-3 victory. Judd Trump, who will play Marco Fu in round two after a 10-6 win over Stuart Carrington, said of O'Sullivan's antics: "Obviously he likes attention. I don't know if he's done it on purpose or not, who knows?" In the second round, defending champion Mark Selby is level at 4-4 with Anthony McGill, while John Higgins leads Ding Junhui 5-3.